There has been disagreement over whether the word ‘enclave’ or ‘municipality’ should be used to describe Serbian majority areas in Kosovo. 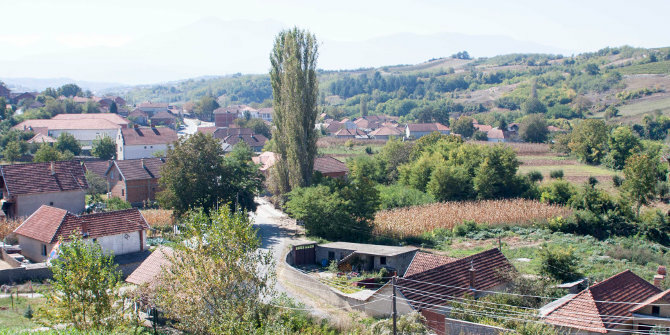 Emilie Fort digs into the topic of how Serbian majority areas in Kosovo are described by political elites and the international community, and what problems the word municipality poses for Serbian communities themselves. Almost a year ago, as I exchanged some emails with a professor in Belgrade, she observed my use of the term “enclave” regarding the situation of Serbs in Kosovo. She stated that “municipality” is now the right denomination. It is accurate to say that consecutive to the negotiations between Belgrade and Pristina, under the guidance of the European Union, the Kosovo administrative map has been redrawn and 10 Serbian-dominated municipalities have emerged in the territory of Kosovo. At that time, I wondered whether this political reality matches the social one and if those Serbian municipalities contribute to ‘disenclaving’ the Serbs in Kosovo, meaning ending their isolation and providing them with freedom of movement. Some long-term fieldwork I have conducted in four Serbian villages in Kosovo (in Orahovac, Velika Hoča, Gračanica and Štrpce) provides some avenues to answer that question. Based on participant observations and interviews with local Kosovo Serbs, my nine-month fieldwork research revealed a huge gap between the Serbian community’s social reality and the concept of the municipality promoted by Kosovo’s political elites and the international community. Traveling through Kosovo, the dominance of the Albanian language, which can be seen everywhere on road signs, stands in contrast to the limited and bounded expression of Serbian symbols in Serbian majority areas, like Gračanica, Mitrovica North or Štrpce. As previous research has shown, the symbolic appropriation of a territory is a key element in the building and securing of a group identity. On several occasions, interviewees provided examples of situations where they fear expressing their Serbian origin or they have to be careful in doing so. Walking in the streets of Pristina, they pay attention to wearing clothes without any visible Serbian signs. The majority of them do not use formal Kosovo transportation or speak Serbian in the main Kosovo Albanian cities because they fear that Kosovo Albanians could perceive it as a provocation. These situations constitute restrictions on Kosovo Serbs’ everyday lives and limit their freedom of movement, and their freedom more broadly. Even if they acknowledge the benefits of Serbian-dominated municipalities in terms of representation and services, these political units do not provide them with a sense of integration. Many Kosovo Serbs used the terms “ghettos,” “prisons,” “enclave” and several times “reserves” when they talked about their living environment. They usually associated their lack of freedom with their inability to return to cities or to travel safely outside Serbian places. What about Serbs in non-majority areas? Focusing on municipalities rather than enclaves also contributes to doubly marginalising Serbs who live in non-Serbian majority areas. Whether it is through literature or the media, there is a tendency to present Serbs in Kosovo as a homogeneous community. However, a few Serbs remained in Western Kosovo after the war and continue to live in quarters or villages which are isolated both from Serbia and from other Serbian places in Kosovo. During my fieldwork, I spent four months in the Serbian quarter of Orahovac and in the village of Velika Hoča located in the municipality of Orahovac. Due to their low demographic percentage, they face resistance regarding their representational capacity at the municipal level but also in their everyday lives. Contrary to Serbs in majority municipalities, Serbs in Orahovac and Velika Hoča are unable to appropriate symbolically the territory. Only a few pieces of graffiti mark these places as Serbian. Also, direct and indirect forms of harassment performed by Kosovo Albanians exacerbate their sense of isolation and marginalise them further, contributing to an ongoing exodus of the Serbian minority and preventing the return of Serb refugees. The competences provided by the Constitution and other laws, notably to the Serbian community, contribute to creating an idea that Serbs are now well integrated both within formal Kosovo institutions and within Kosovo’s society. Speaking about “municipalities” puts the emphasis on the rights granted to Kosovo Serbs and their representation, while talking about “enclaves” suggests an image of failure and marginalisation. From a long-term perspective, speaking about municipalities rather than enclaves contributes to several potentially dangerous shortcuts. The focus on the elite and political level entirely overlooks the reality for ordinary people. Previous research has revealed, however, the difficulties associated with reaching social cohesiveness, as well as a sustainable peace and stability, without solving societal issues. This also contributes to promoting a failed state-building international policy. Thus, despite obscuring a social and practical reality, emphasising ‘municipalities’ rather than ‘enclaves’ also participates in perpetuating a non-functioning system. Note: This article originally appeared at the PSA Blog. It gives the views of the author, not the position of EUROPP – European Politics and Policy or the London School of Economics. Emilie Fort is a PhD candidate in political science at Université Laval (Quebec, Canada). Her doctoral thesis is on the influence of enclavement on the Serb identity building process in four Serbian enclaves in Kosovo. Her main research interests include identity, identity politics and nationalism in the post-Yugoslav space. The issue is Albanian hatred of Serbs. How can serbs reconcile with Albanians? It’s time for serbia to totally recognize Kosovo sovereignty and independence. That would be great. So many problems with this article. Is the author suggesting we don’t use the term “municipality”? That is like saying we should not use the term Province when talking about Canadian provinces. Also, not all municipalities are enclaves, only some of them, so using the term enclave indiscriminately is not a good way forward.